Mentoring in IBD is an innovative and successful educational program for Canadian gastroenterologists that includes an annual national meeting, regional satellites in both official languages, a website, an educational newsletter series, and regular electronic communications answering key clinical questions with new research. This issue is based on the presentation made by the contributing editor at the annual national meeting, Mentoring in IBD XVIII: The Master Class, held November 3, 2017 in Toronto, Ontario. Modern therapies for IBD can put patients at risk for infections, including vaccine-preventable illnesses. Prevention of infection is critical for immunosuppressed IBD patients and, since many of these patients will have their gastroenterologist as the only regular contact among medical professionals, assessment for infection should be an integral component of gastroenterology care. This brief overview will discuss recommended infectious disease (ID) screening prior to immunosuppression, the types of vaccines that should be considered and the recommended timing for their administration relative to immunosuppression. In addition, the review will touch on specific infections to be aware of in immunosuppressed IBD patients. Both active and latent infections should be considered in IBD patients. Some of the latter include tuberculosis and infections specific to certain geographic areas (e.g., Strongyloides and endemic fungi). Screening for these should be performed if exposure is suspected and testing is available. Next, one should inquire about the past vaccination history and serologic screening should be done for important viral pathogens, including HIV, HCV, hepatitis B (HBsAg, anti-HBs, anti-HBc) and varicella zoster virus (VZV). If the patient was born after 1970, one should also consider serologic screening for measles, mumps and rubella (MMR). 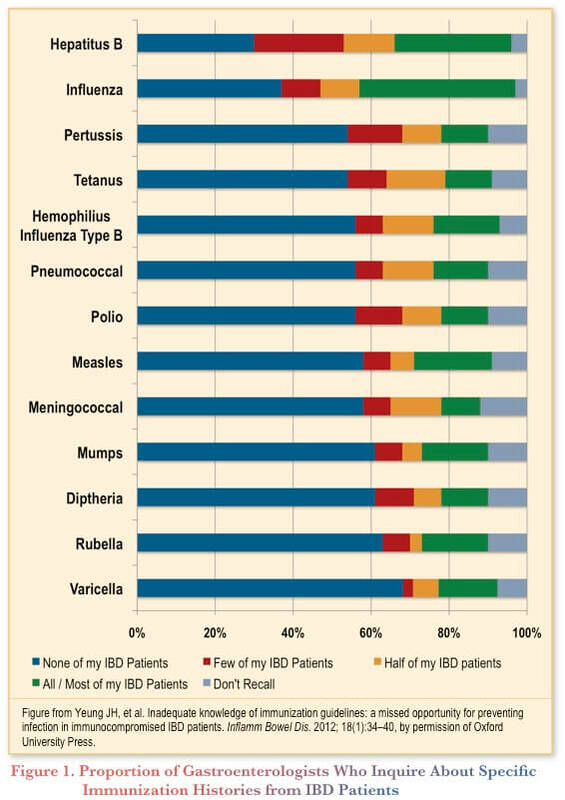 Research conducted in 2012 suggests that gastroenterologists in Canada do not typically inquire about vaccination status (Figure 1) among their patients with IBD. (1) The authors of this study referred to this as a “missed opportunity for preventing infection” in this population. 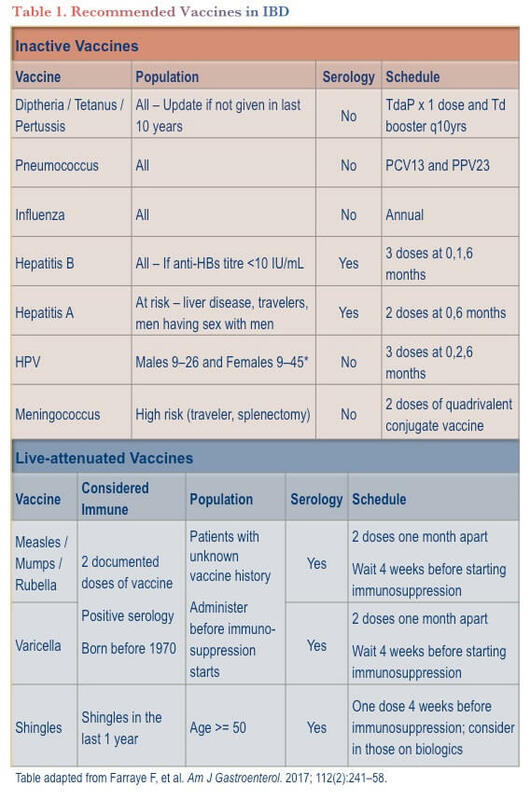 Specific vaccines that are recommended among patients with IBD include those for influenza, pneumococcus, hepatitis B, human papillomavirus, MMR, varicella and shingles (Table 1). (2) Research has shown that vaccine seroprotection can be suboptimal among IBD patients receiving immunosuppressants, including TNF inhibitors. (3) The timing of administration is, therefore, critical to optimizing protection against infection. Inactivated vaccines include influenza, pneumococcus, hepatitis B, and human papillomavirus (HPV) vaccines. To achieve optimal immunogenicity, inactivated vaccines should ideally be given at least 2 weeks prior to initiating immunosuppression or at the nadir of immunosuppression. Titers are not routinely available for most vaccines except hepatitis B; therefore, timing of vaccines in patients on biologics and other immunosuppressives is an important factor. Live vaccines include measles/mumps/rubella (MMR), varicella, and shingles vaccines. These can be given prior to initiating immunosuppression; however, viremia may occur after vaccination; therefore, a period of 3–4 weeks should elapse before initiating immunosuppression. Zoster infection is an area of particular concern in IBD. 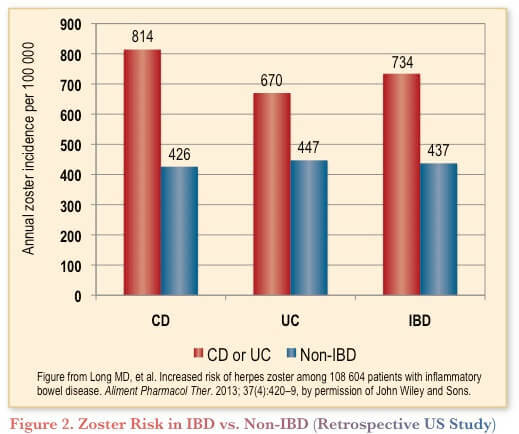 A retrospective US database analysis showed that the annual zoster incidence was 734 per 100,000 among individuals with IBD, significantly higher than the 426 per 100,000 observed among non-IBD patients (Figure 2). 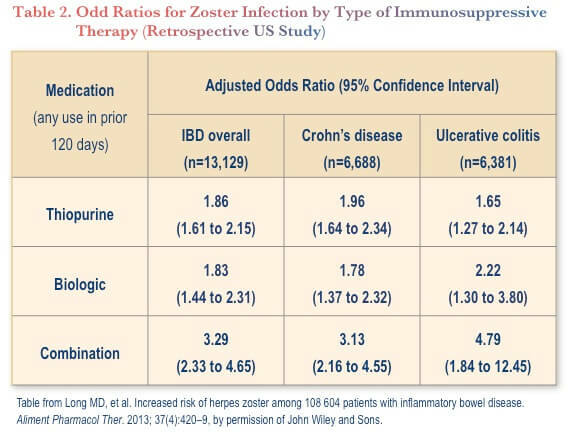 (4) Data from the same study showed that greater immunosuppression was associated with significantly higher risk of zoster infection, with combined use of thiopurines and anti-TNF therapy being associated with the highest risk (Table 2). With respect to vaccination, although live vaccines have generally been contraindicated while on biologic therapy, there are emerging data to suggest safety of live shingles vaccination in patients receiving biologic therapy. (5) In a retrospective study of U.S. Medicare patients aged >60 years with autoimmune conditions (n=463,541, including 66,751 with IBD), 4% received a live shingles vaccine and had a median of two years of follow-up. The risk of zoster infection was significantly lower among the vaccinated vs. unvaccinated individuals: 6.7 vs. 11.6 per 1000 patient years (rate ratio 0.58, P<0.0001). (5) Among patients taking biologics, the infection rates were 8.5 and 16.0 per 1000 patient-years for vaccinated and unvaccinated patients, respectively. In addition to this study, a smaller analysis of the U.S. Veterans Affairs database showed that among 59 anti-TNF-treated patients with IBD who were vaccinated with the live shingles vaccine, there were no adverse events noted out to six weeks. (6) The use of shingles vaccine among patients aged 50 or older taking anti-TNF agents (across indications) is currently being prospectively investigated in the VERVE study of approximately 1,000 patients. (7) The trial is scheduled to finish in September 2019. Beyond vaccination, gastroenterologists should maintain awareness that immunosuppressed IBD patients are at continued risk for infections. (11–13) Bacterial infections of particular concern include pneumonia, tuberculosis reactivation (especially among TNF-inhibitor-treated patients) and nocardia. Opportunistic fungal infections of note include histoplasmosis (specific risk in patients on TNF inhibitors) and pneumocystis (which has been described in patients on biologics and high-dose steroids). In addition to zoster, viral infections of note include CMV colitis (especially in severe steroid-refractory ulcerative colitis) and JC virus causing progressive multifocal leukoencephalopathy (PML) in patients on natalizumab. Parasitic infection with Strongyloides may also be a concern. Patients with IBD, particularly those on immunosuppressant therapy, are at high risk of infections relative to the general population. Gastroenterologists, who are often the only physicians regularly seen by patients with IBD, are well positioned to help reduce this risk. Inquiries about vaccination history should be part of the initial workup, with appropriate immunization recommendations made as early as possible, optimally before the start of immunosuppressive therapy. Your patient is a 24-year-old law student who presents to your office with a three-year history of post-prandial lower abdominal discomfort with borderline microcytic anemia and elevated CRP. She is otherwise well. Colonoscopy shows a distorted ileocecal valve (ICV) preventing ileal intubation. Magnetic resonance enterography (MRE) shows extensive ileal disease with skip lesions and segmental dilation. Budesonide 9 mg PO daily is started. You ask if her vaccinations are up to date. She believes that she had all her childhood vaccinations and that she has had chicken pox. Vaccination against Tdap, HAV, HBV, and HPV should be administered as per Advisory Committee on Immunization Practice guidelines. You elect to test for varicella, measles, mumps and rubella IgG, as well as HBsAb and HBsAg. At her next visit, you review the results. She tested positive for varicella, but negative for the rest of the tests. She tells you her family doctor also got her lab results and wants your guidance on vaccination. Since this patient had yet to begin immunosuppressive therapy, all the options were currently on the table. You decide she should receive HBV, MMR and conjugate pneumococcal vaccines. Unfortunately, she tells you her pain is worse. Her C-reactive protein (CRP) has also increased. You decide to start adalimumab and azathioprine in combination. Depending on the patient’s preferences, it may be wise to delay the start of the immunosuppressive therapies until after the administration of the MMR vaccine. Should the patient insist on starting the IBD medications right away, one could still administer the other vaccines (pneumococcal conjugate and HBV). Influenza vaccine (by injection, but not nasal spray) can also be given while on adalimumab. A year after starting combination therapy, the patient reports a painful, itchy rash on her chest. She is in the middle of exams and stressed. Her family doctor is away, so you see her the next day. You make a clinical diagnosis of shingles and start oral valacyclovir. The patient asks if she should stop her medications. The adalimumab product monograph(15) recommends stopping therapy in the event of serious infection. Stopping the immunosuppressants until the infection has cleared is a sound choice. She responds well to antiviral therapy and the rash heals after 10 days. She tells you her father has had a vaccine against shingles and asks if she should also receive it. The patient appears to be looking to take the vaccine. Note that both the varicella and the shingles vaccines are live and should not typically be administered to people who are on strong immunosuppressants. Should she be willing to delay restarting her medications for three months, you could administer the shingles vaccine, as it has been shown to reduce recurrences among those who have already had an infection, although the data on recurrence is largely limited to older populations (≥50 years years). (18) There are limited data for vaccine efficacy in her age group and, as such, we do not know how long the protection would last. Yeung JH, Goodman KJ, Fedorak RN. Inadequate knowledge of immunization guidelines: a missed opportunity for preventing infection in immunocompromised IBD patients. Inflamm Bowel Dis. 2012;18(1):34–40. Farraye F, Melmed GY, Lichtenstein GR, et al. ACG Clinical Guideline: Preventive Care in Inflammatory Bowel Disease. Am J Gastroenterol. 2017; 112(2):241–58. Nguyen DL, Nguyen ET, Bechtold ML. Effect of Immunosuppressive Therapies for the Treatment of Inflammatory Bowel Disease on Response to Routine Vaccinations: A Meta-Analysis. Dig Dis Sci. 2015; 60(8):2446–53. Long MD, Martin C, Sandler RS, et al. Increased risk of herpes zoster among 108 604 patients with inflammatory bowel disease. Aliment Pharmacol Ther. 2013; 37(4):420–9. Zhang J, Xie F, Delzell E, et al. Association between vaccination for herpes zoster and risk of herpes zoster infection among older patients with selected immune-mediated diseases. 2012; 308(1):43–9. Khan N, Shah Y, Trivedi C, et al. Safety of herpes zoster vaccination among inflammatory bowel disease patients being treated with anti-TNF medications. Aliment Pharmacol Ther. 2017; 46(7):668–72. gov. Safety and Effectiveness of Live Zoster Vaccine in Anti-Tumor Necrosis Factor (TNF) Users (VERVE Trial). ClinicalTrials.gov Identifier: NCT02538341. GlaxoSmithKline Inc. Shingrix Product Monograph. Date of Approval: October 13, 2017. Lal H, Cunningham AL, Godeaux O, et al. Efficacy of an adjuvanted herpes zoster subunit vaccine in older adults. N Engl J Med. 2015; 372(22):2087–96. Long MD, Martin C, Sandler RS, et al. Increased risk of pneumonia among patients with inflammatory bowel disease. Am J Gastroenterol. 2013; 108(2):240–8. Seminerio JL, Loftus EV Jr, Colombel JF, et al. Infliximab for Crohn’s disease: the first 500 patients followed up through 2009. Dig Dis Sci. 2013; 58(3):797–806. Dave M, Purohit T, Razonable R, et al. Opportunistic infections due to inflammatory bowel disease therapy. Inflamm Bowel Dis. 2014; 20(1):196–212. Farraye FA. Vaccination of Patients with Inflammatory Bowel Disease. Gastroenterol Hepatol (N Y). 2017; 13(7):431. AbbVie Corporation. Humira Product Monograph. Date of approval: July 28, 2017. Wasan SK, Coukos JA, Farraye FA. Vaccinating the inflammatory bowel disease patient: deficiencies in gastroenterologists knowledge. Inflamm Bowel Dis. 2011; 17(12):2536–40. Yawn BP, Wollan PC, Kurland MJ, et al. Herpes zoster recurrences more frequent than previously reported. Mayo Clin Proc. 2011; 86(2):88–93. Tseng HF, Chi M, Smith N, et al. Herpes zoster vaccine and the incidence of recurrent herpes zoster in an immunocompetent elderly population. J Infect Dis. 2012; 206(2):190–6. (c) Catrile & Associates Ltd., 2018. All rights reserved. None of the contents may be reproduced in any form without prior written permission from the publisher. The opinions expressed in this paper are those of the authors and do not necessarily reflect the opinions or recommendations of the sponsors, the grantor, or the publisher.